Finally. I did what I knew I needed to do in order to start beading. I needed a designated place to put all my beading materials and be able to keep it out for a while. My cutting table/desk is perfect. I knew I was at a good stopping place (not making any new quilts or quilt sandwiches for a bit) and so I set up my beading station. After adding a few beads to the last quilt I showed you, I knew I wanted to work on a quilt that was more about the beading than the embroidery. I had “finished” this quilt a while ago. But while I actually had planned to do beading and/or embroidery in each of the fabric tiles on this quilt, all I got done was some background beading. It was the perfect project to start on. I have several books that I refer to (Robin Atkins book and her brother Tom Atkins book) and I just started in working on each tile. I don’t really know what I’m doing, but its pretty fun. Beading actually goes faster than embroidery, and it is pretty easy on the hands too. There were 54 tiles in this quilt. I am down to the last 12, and so I hope to have this completed to share at Quilting in the Garden. Hope to see you there! You all know I need a little color in my life, right? After working so long on Hallelujah, I allowed myself some colorful play. Mostly meaningless, but fun-to-me projects. Remember this saying that I said I wanted to embroider? Well, one night, I just got a piece of cloth and a blue disappearing ink pen, and went for it. Here’s my version. Can you see where I personalized it? Its not finished yet, but getting there. Had to share! Embroider and a needle, instead of paint and a paintbrush. I recently ran across a new blog, and on the first time I visited, she was doing a giveaway. I was really impressed with one of her paintings, and said that if I won, that was the one I would choose. If you can believe it, I won that giveaway! And so I decided that I would embroider a version of that painting. A pen instead of a pencil, and I fashioned it after a special fountain pen that my dad had given me. I was going to make a regular cake instead of the cupcake, but it was just too cute. I left it as-is. And of course I had to add flowers to the seed stems. Here’s my design wall. I have been working occasionally on Noah, and then I need to take it off the frame and look at it for a while to see if I’m still on track. The two big blocks are just the start of that Genesis quilt I want to do. And the other blocks were what I let myself play around with on Friday. I just like making these cross-cut blocks. These are a lot bigger than the last set I did. 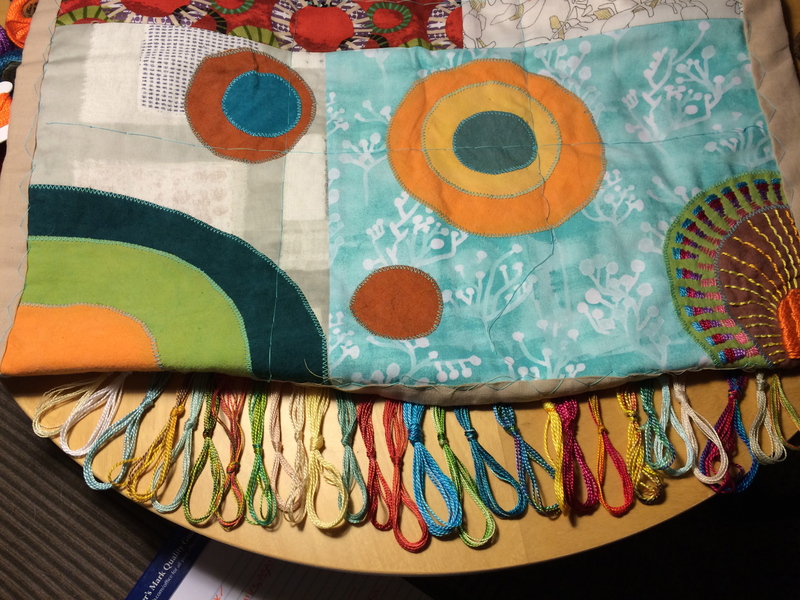 I wonder if that means I’m on my way to making another big quilt?? Last weekend I went down to Quilting in the Garden. I was pretty excited to see my quilt (#74) hanging at the front display right at the entrance to the show! And here is another of my quilts (the cross) hanging on one of the magnificent old oaks. It was really fun to go to this show, and to see my quilts hanging. Its probably not the best venue for my quilts, because they are small, and you can’t really see the details–they are hung pretty high. But what’s not to enjoy about walking around a beautiful nursery and looking at quilts at the same time? 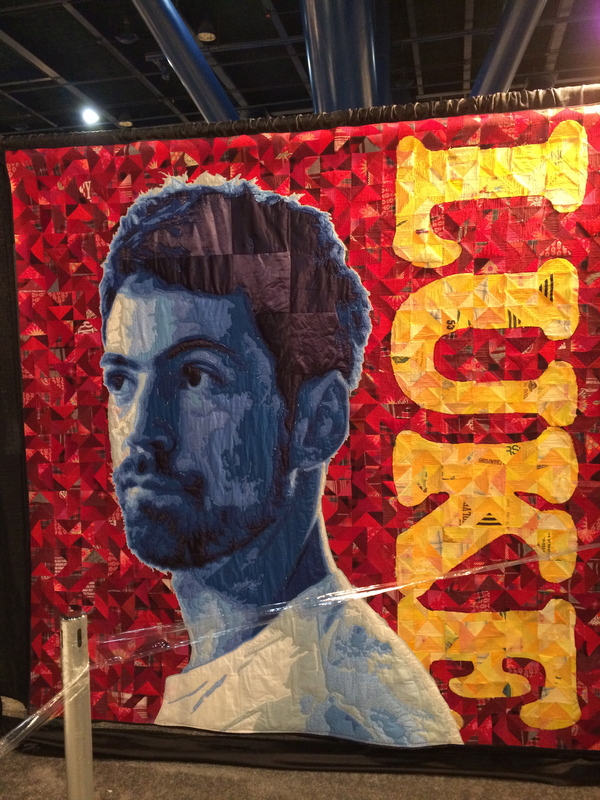 I am back from the Houston International Quilt Festival, and leaving tomorrow for a workshop with Maria Shell. Houston was absolutely fabulous in so many ways. Of course, in Texas everything is bigger, right? Well, the biggest surprise to me was the way the quilts were displayed. There was so much room between the aisles, and even more room between the separate displays. Not once did I feel that I was “fighting the crowds” to see the quilts. Even the big winners were never that crowded. 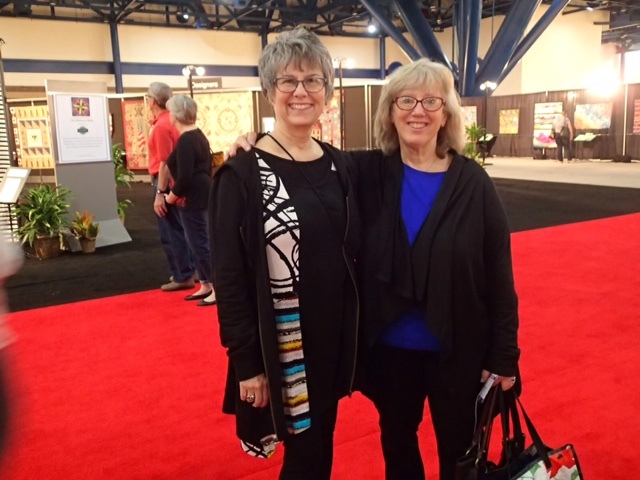 I got to attend the show with my best friend, Robin Fouquette the absolutely fabulous long arm quilter. Robin lives in Oregon, and so we don’t get to see each other quite as often as we’d like. This picture also gives you a little idea of how well spaced the displays are. Sometimes they have a lot of instructions about which quilts you can photograph, and how or when you are supposed to share those with others. So I just picked out a couple that I thought would be okay. I have a definite love for Japanese quilts. Their workmanship and composition and use of color–everything about them just inspires me. This quilt was made by a mother for her daughter, and when I went by one time, she was there with her daughter. I just caught this candid moment, and I love it. 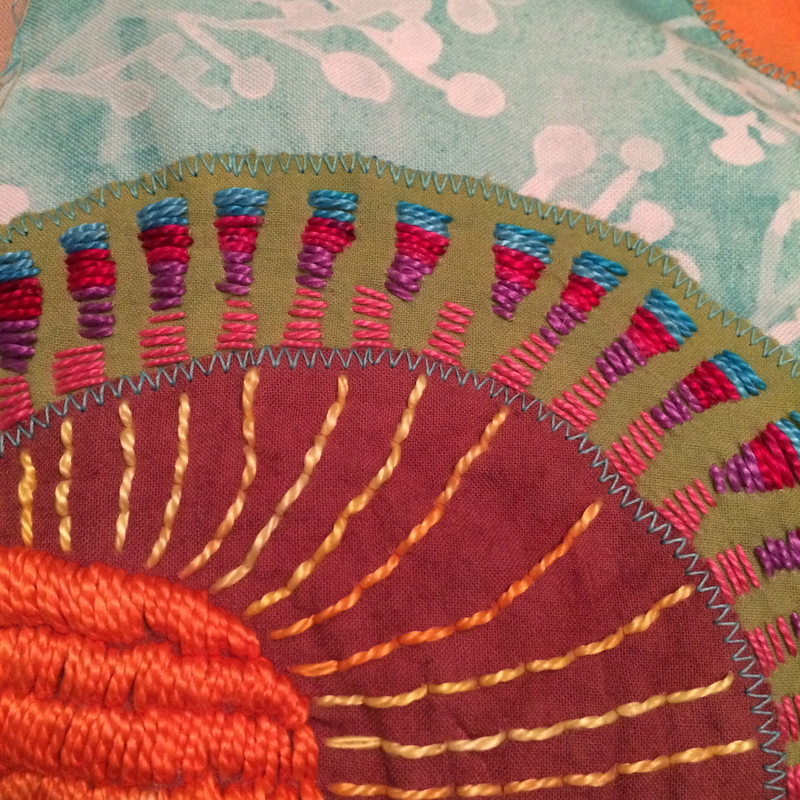 Here are a few details of her quilt–I think all hand done, if you can imagine. Here is the other quilt I will share, because as you see, the quilt maker has done a good job of giving himself photographic credit. Luke Haynes works with used clothing as his raw material. Its just astounding what he can do with it. Oh, and in this picture you can see that they used clear plastic tape to block off the quilts. I loved that, as it allowed you to get a better view of the quilt as a whole composition. 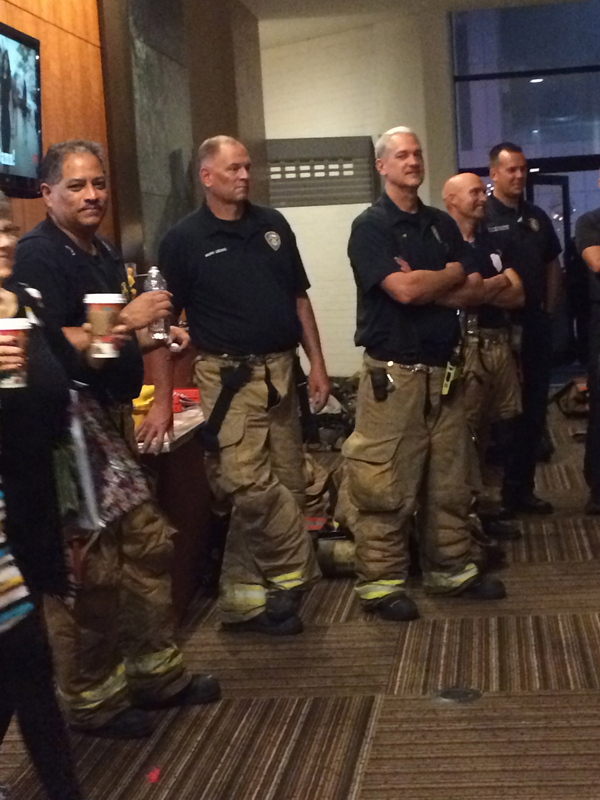 Saturday night there was a bit of excitement at our hotel. We got on the shuttle to come home from the show and dinner out, and the driver announced that he would not be able to take us back to our hotel. Evidently there was a fire. Yikes! Fortunately, he was able to get us within a block of it, and by then most of the excitement had cleared up and they allowed us to come into the hotel. Some of the younger firemen were posing with quilters and other guests, but I enjoyed this group, who were just looking on and having some coffee. The fire was actually outside the hotel, in a manhole or something. Oh, so bad blogger that I am, I didn’t take pictures of any of the people I was able to meet up with. Thursday night Robin and I were able to have dinner with Ricky Tims and his partner Justin Shultz. So fun to have a little time to catch up with Ricky (we were friends over 30 years ago, when we used to show dogs together!! so weird to say “thirty years ago…”) I got to chat with Jenny Lyons, my SAQA friend. And I briefly met Maria Shell when she gave a free demo at the “Meet the Teachers” area of the show. This was a great feature–they had ongoing 30 minute demonstrations by various teachers. All were well done, and it was also a nice place to sit and take a short break 🙂 Last but not least, I finally met up with long time friend and blogger, Kris from Australia! That is the fun of blogging–you meet people online that have similar interests, and then once in a while you are privileged to meet them in person. 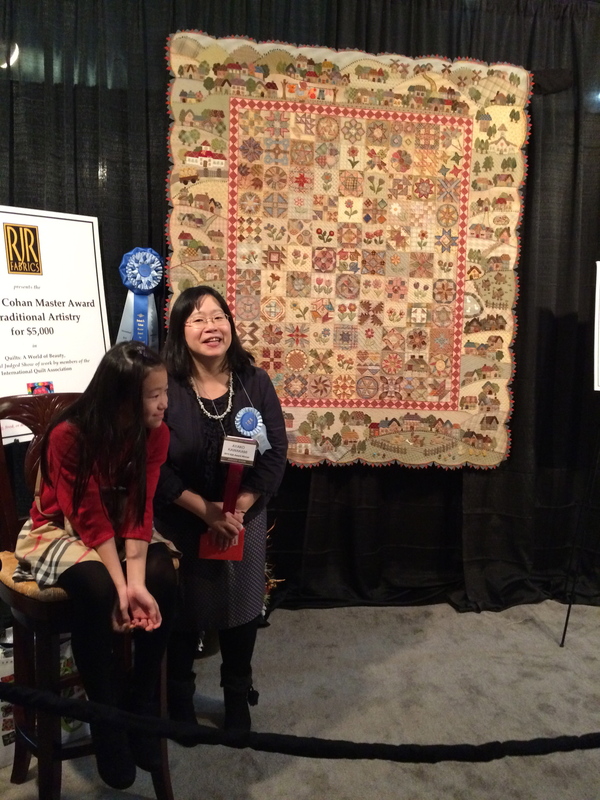 Kris had a beautiful quilt displayed at the show, and she won second prize in its category!! On Sunday another blog friend picked me up and we got to spend a couple of days visiting–doing what we like best: talking, eating, stitching, and watching favorite TV shows. It was an absolutely great way to end this trip, with a day of relaxing before the long journey home. Shelley and I met because of our mutual interest in healthy living, and because we both have a Texas/California connection, we have been able to get together fairly often. One time we met at a frozen yogurt shop and I taught her to knit. One time she took me to her local quilt and knitting shops, and we had oh so much fun shopping, and then sewing together afterwards. This time I made a little quilt sandwich for Shelly to try the embroidery with perle cotton thread. Shelley did some outstanding embroidery! She decided she wanted to make a sun in one of the circles. She did say that she might not be doing too much of that satin stitch in the future. But I love the way it looks! Before I left, I asked her to pick out some colors of perle cotton that she liked, and I picked out a few more to fill in light and dark values, and left her a little “kit” to continue working on her piece. While I was at PIQF and Houston, I was trying out a lot of long arm quilting machines. I have been thinking seriously about whether or not I “needed” one of these. At one booth at PIQF, they were using a frame under the sit-down long arm. I loved it, especially because of the knobs on the side. It seemed to keep my hands in a more ergonomically correct position. When I got home from PIQF, I investigated, and found out that this hoop/frame was made by Martelli. And then I realized that I could use it with my Janome sewing machine for free motion quilting. So when I went to Houston, I was on the lookout for this product, and with BF Robin’s approval, I bought a set (an 8″ and 11″ hoop.) When I got home, one of the very first things I did was to pull this out of my suitcase and give it a try. A very nice product, and one I think I will really use frequently. Oh, so as long as we’re talking long arms, I’ll tell you what I’m thinking. I had tried just about every brand of sit-down long arm out there. I did not like them, and so I was definitely investigating traditional frame long arm machines. On Robin’s recommendation, I tried the Juki, and I LOVE that machine. I spent a lot of time at the Juki booth in Houston, talking to the reps and the educators about the machine and how it works. On the last day, when we were both getting a little tired, I said I’d like to go back to the Juki booth one more time. And when we walked over, I said, “I didn’t even try their sit down machine. Well…..!!! I sat down, gave it a try, and suddenly there were angels singing in the convention center. I LOVED it!! In addition to loving how it sewed, there were a lot of other factors that made it “perfect” for me. For one thing, it requires way less space than the frame machine. I like the way my studio is set up, and if I did get a frame, I would have to rearrange the whole studio, and it would be pretty crowded. In addition, I have knee and back problems, so even if I did get the frame, I would be looking for a stool that would work with it. And lastly, no learning curve. 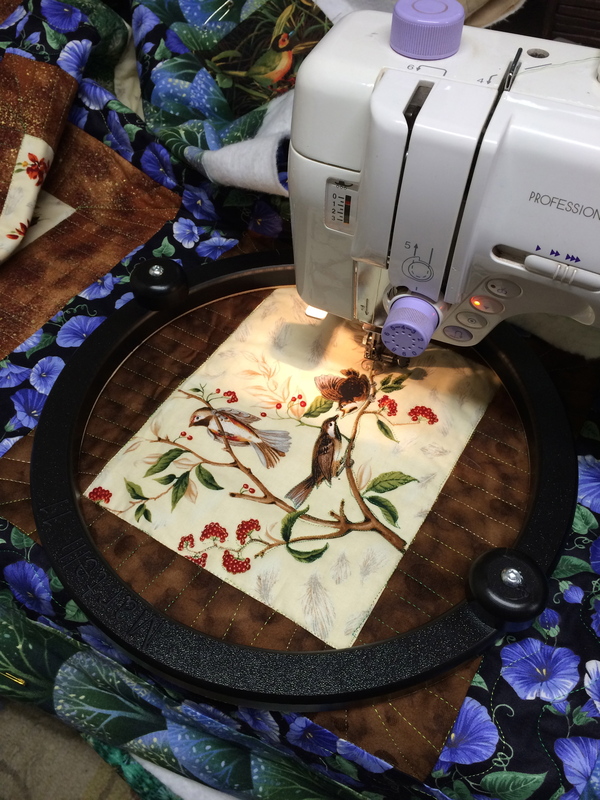 As much fun as it is to watch other people using their long arm, it is a different quilting motion, and there would be some time before I would be able to quilt as well as I do on my current machine. Oh, and if I did ever want a frame long arm, this machine could be easily converted to the frame type. I’ve been meaning to post that the Sacred Threads exhibit opened this past weekend. If any of my readers live on the East Coast, this should be a wonderful exhibit. In addition, they have a lot of fun activities planned to coincide with it. On the first morning of the show I got an unexpected call. Someone wanted to buy one of the quilts I entered! What an unexpected surprise! Its not so much about the money, but more about the thought that someone else appreciated my work. In the meantime, things have been keeping me busy around here, planning for some quilt shows that are coming up. I don’t think I mentioned it, but my BF and I have been planning for a while to attend the International Quilt Festival in Houston! We had our hotel and plane reservations made, but this past week we have spent a lot of time going over all the many class offerings. For me, there are lots of things to consider. Do I really want to learn a new technique? (nowadays the answer to that is usually no.) 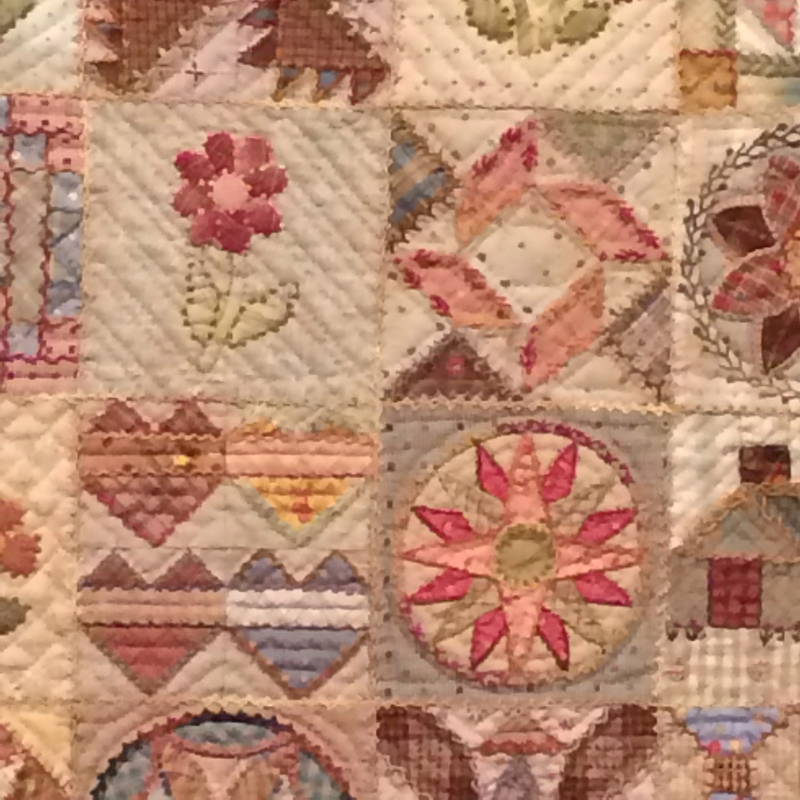 I enjoy spending plenty of time looking at the quilts in the exhibit, and I also really enjoy looking at what the vendors have brought to tempt me. So I don’t want to spend all the time in class. And since we have never been to Houston, exactly how much time will that take? So, I decided to mostly sign up for lectures. There were some excellent teachers and topics listed. Then, kind of at the last minute, I discussed with my BF whether I should take a long arm class. 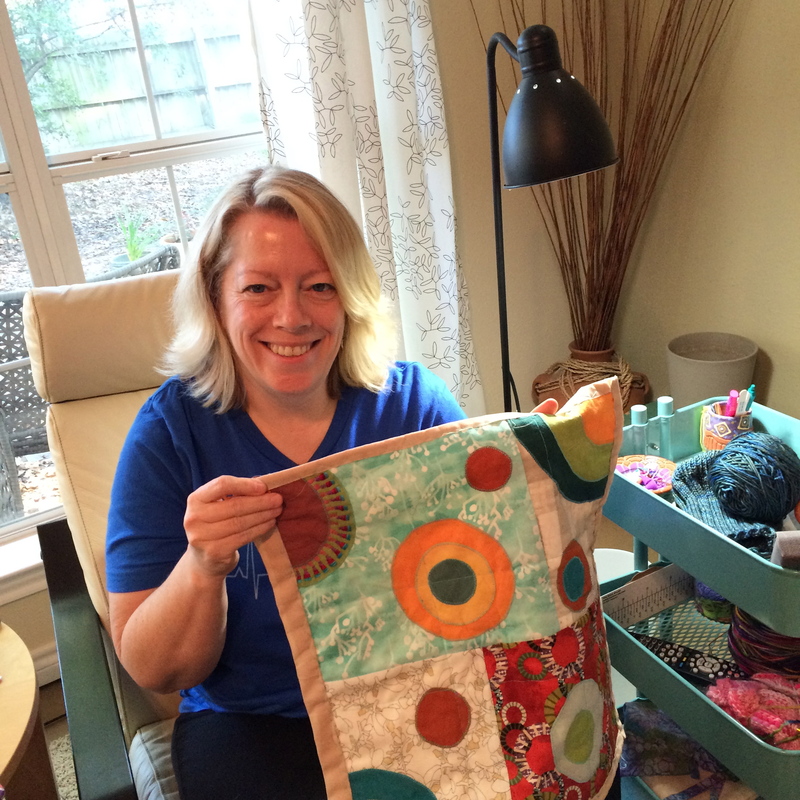 She is a long arm quilter extraordinaire. I have used her Gammil several times. And the idea of getting my own (smaller) long arm machine creeps into my thoughts fairly frequently… So I looked over all the times and topics, and discussed the various teachers with BF, and finally signed up for one. Now to wait and see whether I get into these classes. 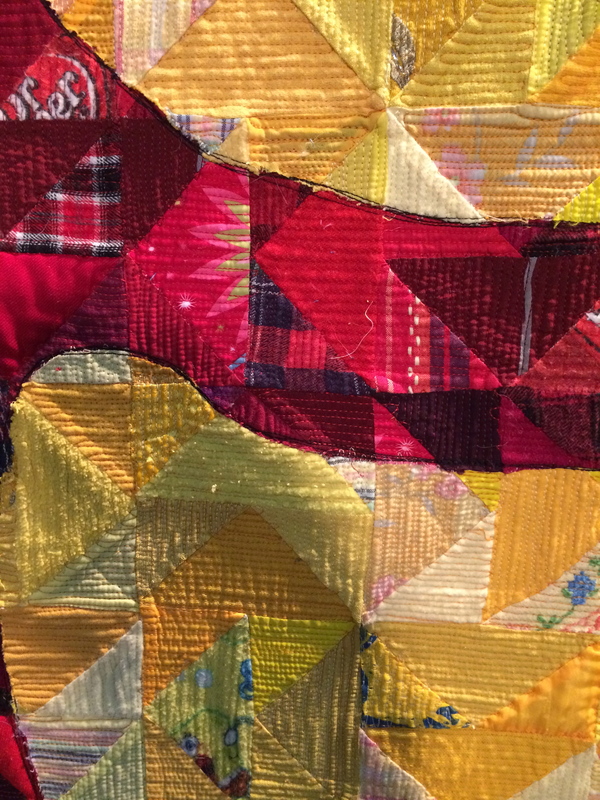 At almost the same time, the information came out about the Modern Quilt Guild’s QuiltCon West! Well, I really wanted to go to that. I signed up the morning that class registration opened, and already Gwen Marston’s classes were full! Its a long ways off, so I might still get into those classes. I will get to hear her lecture anyways. I have taken a class with her, and heard her speak several times. I just enjoy her. And then coming up soonest of all is Pacific International Quilt Show. This is actually the closest show to me, and I enjoy visiting it every year. But this year, since I am going to Houston, I was only going to go for one day. Then I saw on their flyer that Allyson Allen is teaching and lecturing there. I saw her exhibit several years ago, of quilts about slavery. I can’t really tell you how very deeply those quilts affected me. 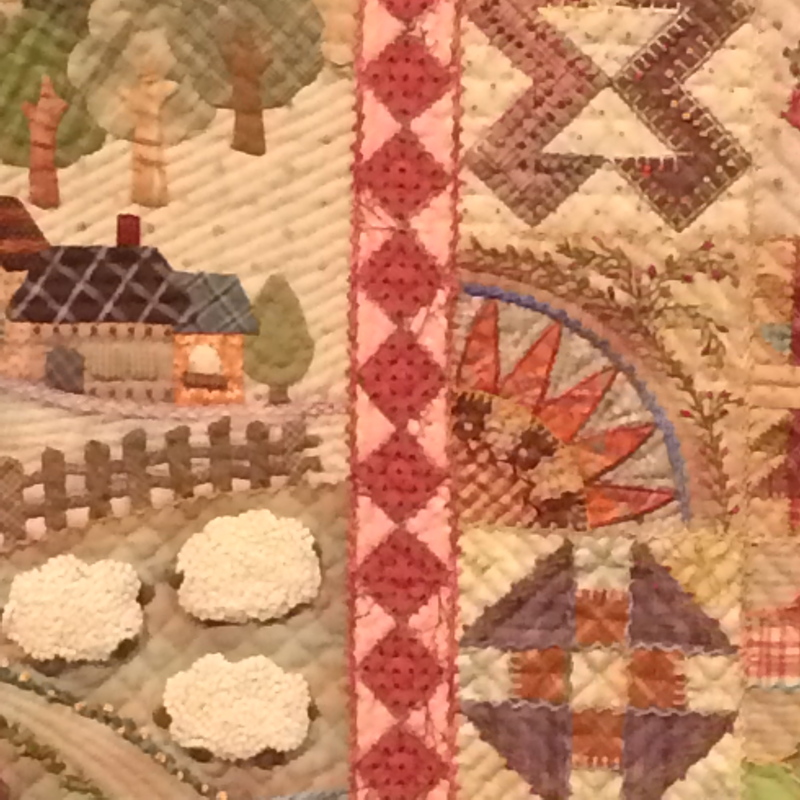 Here is a link to a youtube video of Allyson speaking about her quilts. So I know I really want to go and be able to listen to her lecture. All these things cost money, I am sure you know. I am researching VRBO for places to stay during QuiltCon. And I am checking Hotwire for deals on hotels near to PIQF. In the meantime, I still need to water the garden. 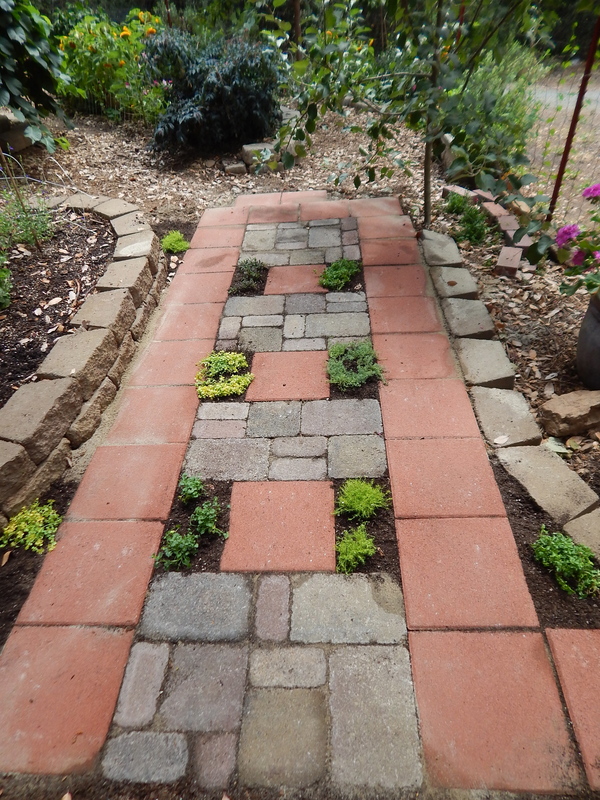 In case any of you don’t read my other blog, here is the latest project–a patchwork path! 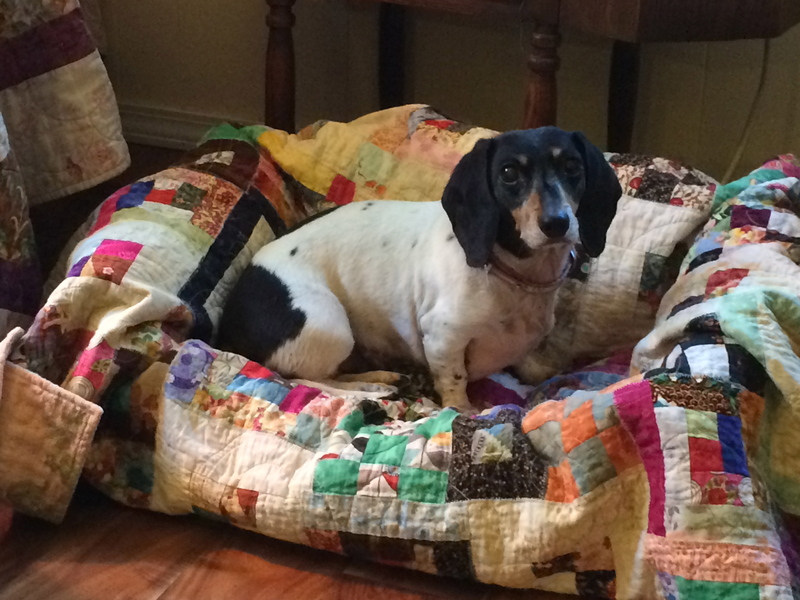 And here is another creative way to use one of my too-many-quilts.